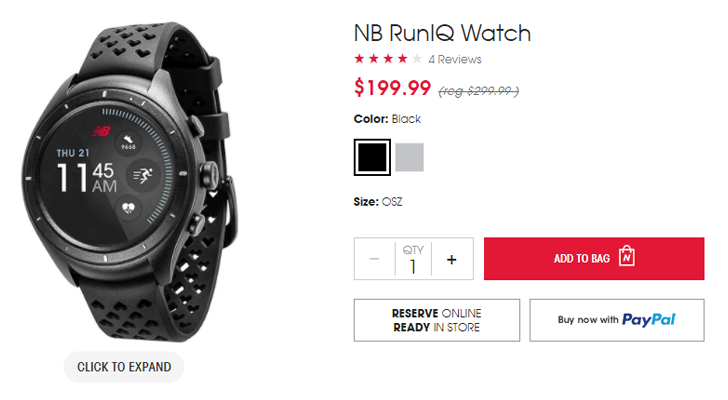 At the start of this year, New Balance unveiled its RunIQ smartwatch powered by Android Wear. It went on sale in February for $299.99, and as you might expect from NB, it was designed primarily as an activity tracker. Now you can get it for a whopping $100 off from New Balance's website. The RunIQ is powered by an Intel Atom Z34XX processor with 4GB of storage, and has a round (no flat tire) AMOLED 400x400 display. It has a 410mAh battery, which is slightly above average when it comes to Android Wear devices. The RunIQ also has Wi-Fi, GPS, and a hear rate sensor - but no NFC, LTE, or speaker. On the plus side, it does have 5 ATM water resistance. The watch runs Android Wear 2.0. You can buy the RunIQ from the source link below. You can order it online, or pick it up in a New Balance store if there's one around you.